Often described as the most British place in North America, Victoria has actually had a long and rich ethno-cultural mix. 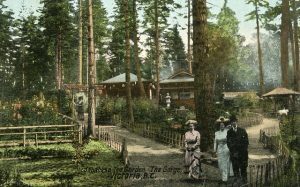 Isaburo Kishida’s tea garden on the Gorge, Victoria, circa 1912 – the first Japanese gardens in B.C. 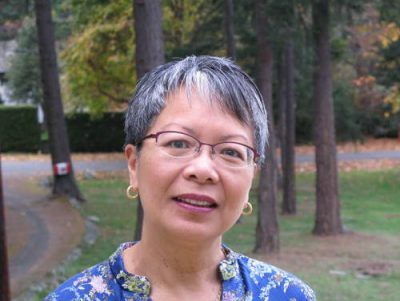 May Wong’s new book takes us through one group after another: Hawaiians; Indigenous and Metis; Blacks; Jews; Chinese; and Japanese, providing details about when and why they first came to live in Victoria. When I was a kid, my father took me on a brief visit to Victoria. Part of the attraction, for him, was that he’d heard the city described as the most British place in North America. Where you could get a taste of Merrie Olde England by riding a red double-decker bus or having high tea at the Empress. And so it was, a predominantly white city with a slight British accent. I do not recall noticing any of the ethnic or cultural groups that are the focus of May Q. Wong’s book, City in Colour. Well, maybe Chinatown. It was only much later, when I settled in the Gulf Islands and frequented Victoria for shopping and occasional entertainment that I realized just how rich Victoria’s ethno-cultural mix is, even today. Wong shows vividly how much more diverse the city was at various times in the past. She takes us through one group after another: Hawaiians; Indigenous and Metis; Blacks; Jews; Chinese; Japanese. For each, she details when and why they first came to live in Victoria or its surroundings and then provides snapshots of particularly interesting individuals and families. She begins with the Kanakas, young Hawaiian men who came to B.C. while working for the Hudson’s Bay Company (HBC) in the fur trade. (Full disclosure: I myself wrote a book about the Kanakas many years ago.) Wong mainly calls them Hawaiians, claiming in a footnote that the term Kanaka “became derogatory.” I beg to differ. That’s what they called themselves, and their descendants still do so. As she explains: “Hawaiians helped build Fort Victoria” living outside the fort’s walls “on Humboldt Street, where the Empress Hotel now stands,” owning “small cabins or shacks along what was known as Kanaka Row.” A capsule biography of second generation Kanaka Maria Mahoi brings the story into the present day; her former home on Russell Island is sometimes open to the public, with descendants on hand to greet visitors. A particularly fascinating chapter traces the lives of three mixed-race (Metis) women who married prominent HBC men and played important roles in early Victoria. Amelia Connolly Douglas, a half-Cree woman, became the wife of James Douglas, B.C.’s first Governor, and himself of mixed race, his mother being “a free woman of colour who had been born in Barbados.” Wong explains that the Fraser Gold Rush “resulted in more people with racial prejudices coming to the colony,” mainly from the U.S. Not even being the governor’s wife “could protect Amelia or her daughters from social snubs. One of the worst culprits was Amor de Cosmos, who had come from California” and “used his position as publisher of the British Colonist” to target Amelia and her family. Isabella Merilla Mainville Ross, wife of HBC Chief Trader Charles Ross, was of Ojibwa background on her mother’s side. 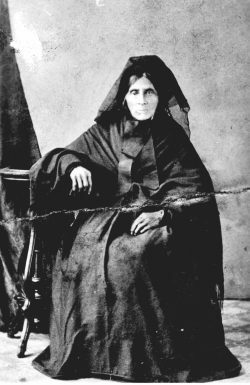 She outlived him, acquired large land holdings and become “the first registered female landowner in the Colony of Vancouver Island.” Josette Legace, of half Nez Perce background, married John Work (eventually Chief Factor at Fort Victoria) and accompanied him “on his long and dangerous journeys” on the Columbia or Snake rivers, which included episodes “punctuated by the flight of arrows and the flash of firing muskets.” Later, at Fort Simpson on the northern BC coast, “She became an accomplished taxidermist, and she started doing social work among the local Tsimshian women, practicing her midwifery skills, and teaching the young girls how to cook, sew, and clean in European fashion. Apparently she had some influence in stopping the practice of slavery by many of them. The next group featured also had experience with slavery. In the late 1850s, just before the American Civil War, 400 to 800 Black Americans came north from California, where they faced increasing discrimination, at the invitation of Governor Douglas. They were vastly outnumbered by the 30,000 Americans, mainly white, who flooded into Fort Victoria. Most were en route to the Fraser Gold Rush. Douglas “was concerned that the Americans would call for annexation,” and thought the Blacks less likely to be loyal to the United States. Their community was led by Mifflin Gibbs, who had founded a Black newspaper in San Francisco. 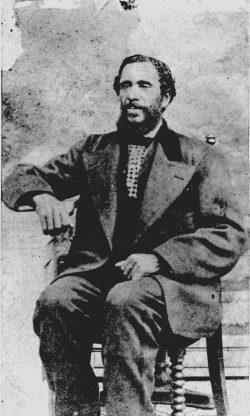 In Victoria, “he was elected and served two terms on Victoria’s city council.” After the U.S. Civil War, when slavery was abolished, Gibbs returned to the U.S., where he became a judge and later the consul to Madagascar. Many other Blacks also went back, but others remained. This included a group that had pre-empted land and farmed isolated holdings on Salt Spring Island. The most remarkable life portrayed here is of Sylvia Estes Stark, who was born a slave in 1839 and died on Salt Spring in 1944 at 105 years. Much of the commerce in Gold Rush Victoria involved selling food, clothing, tools, and other goods to miners. Immigrant Jews played a large role, and their community soon built a synagogue and organized a Hebrew Ladies Association. The size of the Jewish community ebbed and flowed over the ensuing decades in tandem with Victoria’s economic ups and downs. 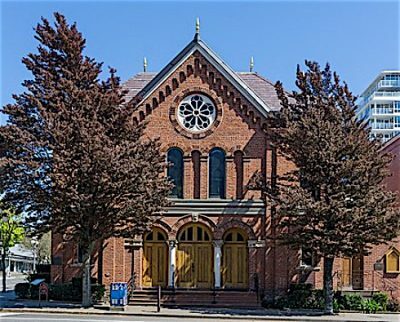 “By the end of the Second World War there were only fifteen Jewish families supporting the synagogue,” which fell into disrepair. By far the largest of Victoria’s ethnic communities, and the one that retains the greatest visibility today, was the Chinese. They first arrived with other hopefuls from California to join in the Gold Rush, or to sell to the miners and take part in the city’s real estate boom. “Thus was initiated Canada’s first Chinatown.” A second, much larger wave of Chinese immigration arrived in the early 1880s to build the Canadian Pacific Railway. Tens of thousands were recruited in China, and once the railway was completed, many settled in Victoria, soon constituting almost one-third of the city’s population. Small wonder that the Chinese initially kept to themselves in Chinatown, where prostitution, gambling, and opium smoking (which was legal) flourished. 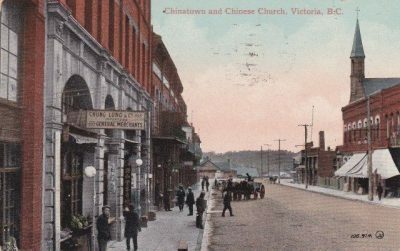 In 1898, only four Chinese children attended school in Victoria. The numbers gradually grew, leading to an English language test for Chinese children (but not other “non-English speaking newcomer children”) and the maintenance of Chinese-only public schools until after the Second World War. One notable Chinese resident and restaurant owner was Chan Dun, who came to Victoria at sixteen and, with his wife Koo Ching Lim, had twelve children. The Chinese Nationalist League (CNL), which supported Dr. Sun Yat-Sen’s republican revolution, had started a school of aviation in Saskatoon, to train pilots for Sun’s flying corps in China. Chan Dun was approached and helped to establish the Victoria Chinese Aviation School. “The intent was to train pilots to fly for the National Chinese Air Force or for Chinese commercial airlines.” Initial training went well, but one student crashed into the sea, destroying their only aircraft and forcing the school to disband. Wong notes that the Mounties kept both schools under surveillance because of their affiliation with a foreign revolution. 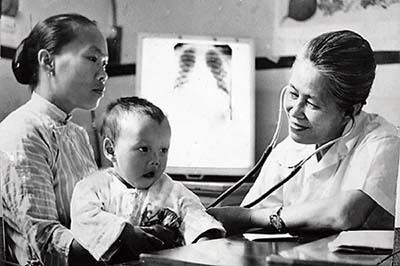 A greater impact was made by Dr. Victoria Toy Mea Chung, a medical missionary born and raised in Canada but dedicated to bringing “the benefits of modern Western medical care to the people of China.” Named after her home city and the reigning monarch, she became a devout Christian. The Chinese were banned from practising medicine in B.C., so she went to medical school at the University of Toronto, became the first female intern at Toronto General Hospital, and left Canada in 1923 for her missionary work in China. Chung returned to North America several times for post-grad medical training, but spent most of her life in China, including during the Japanese invasion and occupation. She survived the Second World War and, trying to remain inconspicuous, she kept practising both her religion and medicine even under Communist rule. She died just as the Cultural Revolution was beginning in 1966, and Red Guards raided her house “That she was a religious person and had been born overseas would have made her even more of a persona non grata, but her family and friends kept her legacy a secret.” Only in recent years did the Chinese government belatedly recognize and honour her dedication to health care in China. 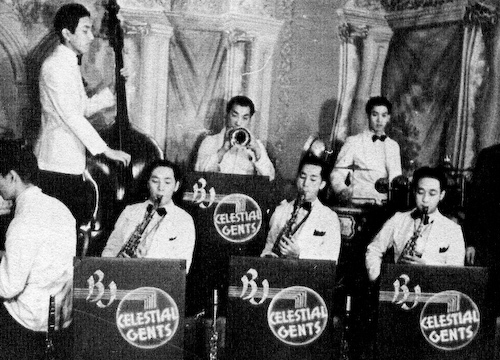 The final group that contributed to Victoria’s diversity was the Japanese. Wong tells the sad tale of their internment and evacuation from the coast during the Second World War. By then, however, they had transcended severe discrimination and left an indelible mark on Victoria’s social and cultural life, especially by establishing fabulous Japanese gardens and teahouses that were popular with all sectors of society. Guests entered an enchanted world when they walked under either of the two arched torii entrance gates at each end of the garden. The paths led them to colourful plantings contrasted with shades of cool greenery; past ponds filled with goldfish, mandarin ducks, or fragrant lotus flowers; by babbling streams criss-crossed by bridges, curved or arched; and past a rock garden representing a mountain or island scene where one could sit on an ornamental bench to contemplate life. Soon Kishida was hired by James Dunsmuir, B.C.’s wealthiest man, to created a Japanese garden on Esquimalt Harbour (today’s Royal Roads University.) He also worked for Jennie Butchart at her family property on Tod Inlet. The rest, as they say, is history. 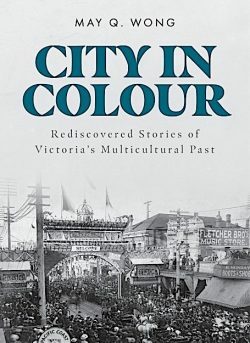 City in Colour is a lively, very readable and welcome celebration of Victoria’s multicultural heritage. May Wong does full justice to the prejudice and discrimination experienced by all of these groups without making it a depressing account of victimization. It is full of thoroughly researched little vignettes about people who have been largely lost to living memory, but should not be forgotten. At times it is almost too detailed, as when she mentions every last honour earned by several individuals in their long and busy lives, or lists all of the children of certain couples, along with their dates of birth and death and the number of their subsequent children. But such information may have real value to these descendants. Given the broad scope of the material and sources, there are very few inadvertent errors, (e.g. writing Queen Victoria when she obviously meant Queen Elizabeth I.) The book includes extensive endnotes, a useful chapter by chapter bibliography, and many well-reproduced black and white photos. All in all, a tour de force. Tom Koppel is a veteran B.C. author and journalist who has published five books on history and science. 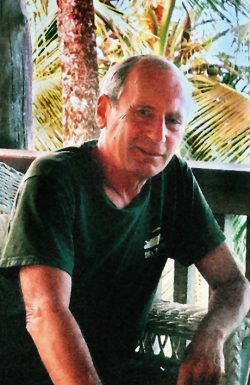 For 35 years, he has contributed feature articles to major magazines, including Canadian Geographic, Archaeology, American Archaeology, Equinox, The Beaver, Reader’s Digest, Western Living, Islands, Oceans, and The Progressive. 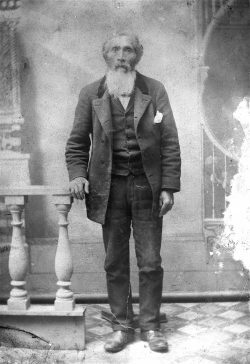 His book Kanaka: The Untold Story of Hawaiian Pioneers in British Columbia and the Pacific Northwest (Whitecap Books, 1995) is available from koppel@saltspring.com. Tom lives with his wife Annie Palovcik on Salt Spring Island.